Professor Richard Guyatt was a British designer and academic who has been described as ”one of the 20th century’s most seminal figures in the world of graphic design”. Born in La Coruña in Galicia, north-west Spain, Guyatt moved to the United Kingdom at the age of ten. Demonstrating a talent for drawing at an early age, Guyatt began his career as a freelance graphic designer at the age of 19, designing posters for the likes of Shell-Mex and BP. As part of the war effort Guyatt also worked in camouflage, helping to hide Scotland’s factories from the Luftwaffe. 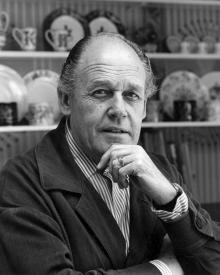 On his appointment in 1948, Richard Guyatt was the youngest ever professor at the Royal College of Art where he worked for 34 years, later becoming rector from 1978-81. Guyatt helped to relaunch the institution as a place that prepared postgraduate students for lives in the specialised design professions just beginning to emerge, through teaching by active practitioners rather than career academics. He also coined the term graphic design, and expanded the curriculum to include graphics, typography, illustration, printmaking, photography, film and television design. While at the RCA Guyatt worked as a consultant designer to Wedgwood, WH Smith and a number of British companies. Other major commissions included creating coins for the Royal Mint, as well as postage stamp designs for Royal Mail. In 1969, Guyatt was made a Commander of the British Empire (CBE).